When I was about six, my father used to take me to a local pet store on occasion so that I could check out the animals for sale. Although I was certainly interested in the puppies, gerbils, guinea pigs, and snakes, the highlight of the trip was always a large Brachypelma smithi, or Mexican redknee tarantula, kept in an aquarium at the back of the store. As a boy who was terrified of spiders, I couldn’t help but to be utterly fascinated by this amazing animal. Although it should have been the stuff of nightmares for me, I couldn’t get enough of it. 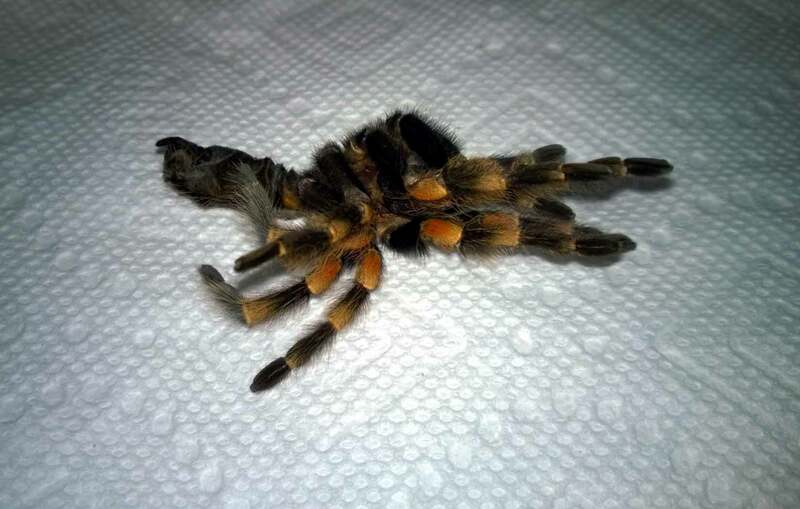 Fast-forward a few decades… With my T collection growing, I decided that I had to have a B. smithi. After all, this was arguably the animal that kicked off my fascination with Ts all those years ago, and it was still widely considered to be one of the most popular tarantulas in the hoby. As this species is known for its very slow growth rate, I decided not to pick up a sling and instead searched for a juvenile to young adult female. The B. smithi is thought to be one of the tarantulas with the longest longevity, with some folks suspecting female could live 40 years or more. I’ll admit, it’s a little mind-blowing to think that a pet could outlive me! My Brachypelma smithi female shortly after I acquired her in December of 2013. I finally located my girl when my favorite tarantula dealer, Jamie’s Tarantulas, had her cyber-Monday sale last year. My 3″ B. smithi female arrived in early December, and she was gorgeous. For her temporary housing, I used a Sterilite 12 quart plastic storage box, filling it with about 2″ of dry coco fiber. Although I normally use cork bark for a hide, this time I bought a much more fancy resin cast log. A small ceramic water dish was supplied for fresh water. This is a tarantula that thrives in a dry environment, so I do not mist or moisten the substrate. Check out my female B. smithi below! B. smithis are generally known for being calm and docile (although there are always exceptions to these “rules”), so I was surprised to discover that my new acquisition was actually very skittish and very fast. My first time opening her enclosure, she nearly bolted out; this is why you can never let your guard down with any T. For the first two months I owned her, she was quite reclusive, rarely venturing out from beneath her log. When she did emerge, the slightest disturbance would send her scurrying for cover. The first cricket offered was still alive and kicking the next morning, and I actually saw her bolt from it at one point. It was obvious she was not yet completely comfortable in her new surroundings. I waited a couple of days, then offered her a dubia roach with its head crushed (Yup… gross, but it keeps them from burrowing and playing dead). I placed on its back in front of the opening to her den in hopes that she would sense it when she ventured out. It was gone the next morning. Although I continued this process for a few months, she now readily takes live and kicking large crickets. B. Smithis are New World tarantulas and, as such, use urticating hairs for defense. When stressed, they can kick these irritating bristles from their abdomens, causing itching, burning, and discomfort to any potential predator (or well-meaning keeper) mucking with them. I’m fortunate in that my girl doesn’t seem to be prone to kick yet. She also calmed down a great deal from when I first acquired her. Now when her cage is disturbed, she will usually just scurry to her den and perch herself on top of it. 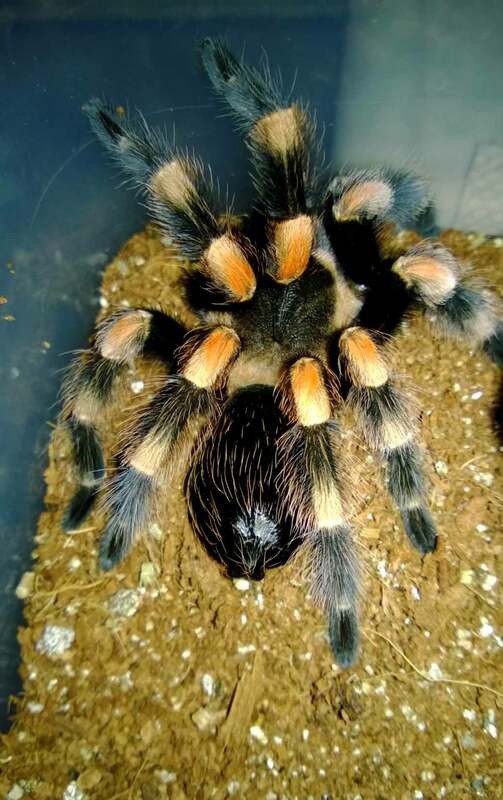 She spends the majority of the time out in the open now, which is great, as she really is a beautiful T.
Like my other Ts, my B. smithi is kept at high 70s during the day and low 70s during the night. She generally eats two 1″ dubia or three large crickets a week. By late February, her abdomen was quite plump, and I cut back on the feeding in hopes that premolt would be coming soon. Finally, in mid-April, she molted. My 3-4″ B. smithi female after a molt. The white patches on her abdomen hint that she might have experienced a little trouble. The discarded molt (exuvia) from my female B. smithi. As she molted inside of her den, I unfortunately did not get to witness the process. I did, however, notice that when she emerged, she had two shiny white spots on her abdomen that probably signified that she experienced a bit of trouble with the molt. I waited a couple weeks before offering her a prey item, and was relieved when she snatched up the first cricket I dropped in. Although she seems to be fine, I will definitely be paying extra attention when it comes time for her next premolt. My 3.5′-4″ B. smithi perched atop its log hide after a recent meal. It might have taken dozens of years, but I finally have my B. smithi. With their ease of husbandry, generally even dispositions, and undeniable beauty, there is a reason this species has been the face of tarantula keeping for decades. Red Knees have earned a reputation over the years for being very docile and handleable, especially when they get closer to their adult sizes. Many report that their B. smithis are very calm and tolerant of handling. However, like all species, temperaments can vary from individual to individual. 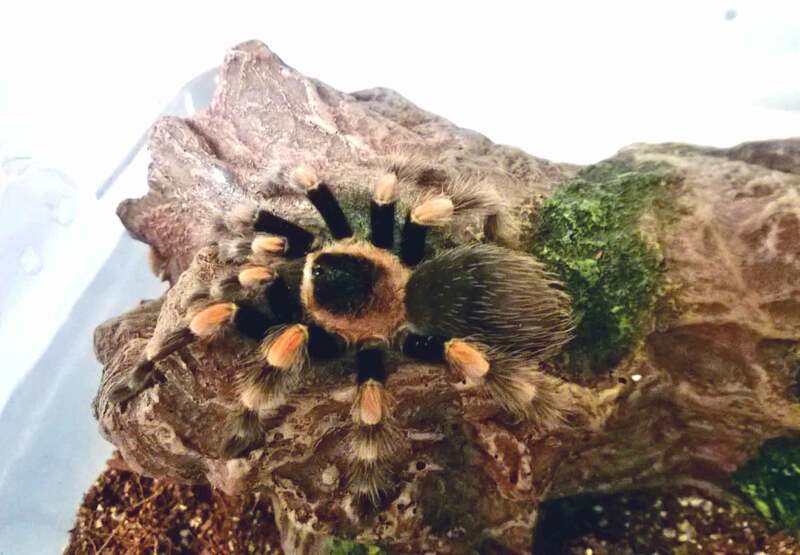 At this point, I would not attempt to hold my own 4″ B. smithi, as she is much too high-strung and prone to hair flicking. She is not aggressive, and I don’t think that she would bite me, but I’d definitely end up with a handful of urticating hairs if I tried to hold her. Now, that’s not to say that she wont settle down when she gets older, in which case handling would be okay. This seems to be a species that mellows a bit with age (possibly due to the fact that in the wild, the bigger they are, the less likely they are to become something else’s lunch!). If you get a younger specimen, just be prepared that he or she might not be up to the close contact yet. These guys can really move when spooked, so make sure that any handling attempts are made close to the ground and in a place where you can easily wrangle the T back up if she bolts. Always test the Ts temperament out first by lightly guiding her with the soft end of a paintbrush. If she turns to attack it or starts kicking hairs like mad, you might want to hold off on the handling for a bit. So, short answer, this species is recognized for being docile and handleable, but there are always exceptions and caution should be taken. Hope that helps! hey! I bought a mexican red knee last month and it hasn’t eaten ever since. Should I worry? It’s abdomen had a light brown spot and is now getting black, is he preparing to molt? Hi, Thomas. What size is it? Is it a sling? it’s one year old and is around 1.6”, how do I send you a picture? At that size, it’s probably closer to a couple years old…they grow VERY slowly. A spider that size is well-started and can go without eating for a while. It’s possible that it’s in premolt. I wouldn’t worry too much. Is its abdomen fat? can’t send it through mail since my pc is a bit broken, it can’t send pics anymore through mail. Anything else? I wouldn’t call it fat.. but what do I know about it , but I see that is his abdomen is fully black now. Unfortunately, I think that you’re only able to keep local species in Australia. 😦 You might not be able to find them there.